Growing up, one of my favourite meals was spam, eggs, and rice. It doesn’t sound particularly Chinese, but spam, or luncheon meat, is actually a pretty big part of Chinese cuisine. You’ll see it in so many dishes on the menus in HK style cafes: spam with macaroni in soup, spam sandwiches, and of course, spam and egg on rice or instant noodles. The secret to spam tasting so delicious is to gently fry it so that it essentially confits in it’s own fat. When frying, there’s no need to add any oil to the pan – plenty of fat will render out of that deliciously geometric piece of meat and turn it into a crispy, salty, addictive, why-have-I-never-had-this-before piece of awesomeness. Also key is frying it low and slow. Too high and the outside of your spam will burn, which would make you sad, so try to avoid it. Spam is awesome on it’s own, but when you pair it with eggs, it’s even better. I know everyone makes fun of the whole throw an egg on it, but as an egg lover, I’m all about the eggs. Here I did a little tamago-yaki, which is a Japanese-style omelette made with eggs, sugar, and soy. The little bit of sweetness really makes the eggs. Tamago-yaki doesn’t really get much love, but it happens to be one of my favourite Japanese dishes and I’m forever making loaves of tamago-yaki and eating them up. This salad roll (ha! There’s no salad in this roll) is something I came up with while I saw some leftover spam in the fridge. Mike was a little iffy about the whole thing, but once he tasted them, any indecisiveness flew out the door. 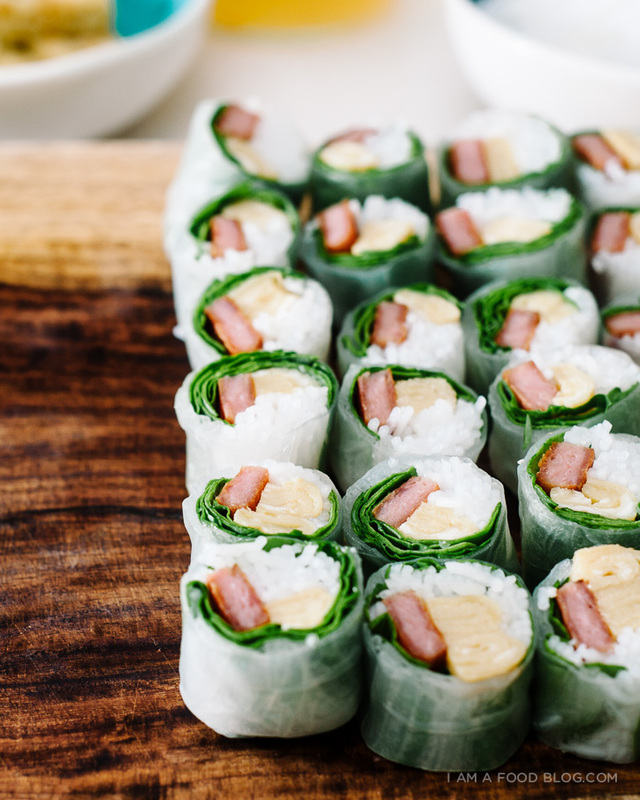 These guys are good: sweet tamago-yaki, savoury crispy spam, a little bit of raw spinach for some freshness, and vermicelli all wrapped up in a rice paper hug. Remove the spam from the can. Slice the block in half and save one half for spam fried rice or whatever your heart desires. Slice the remaining half into 3 even slices and then cut each spam steak into 4 strips so you have 12 strips. 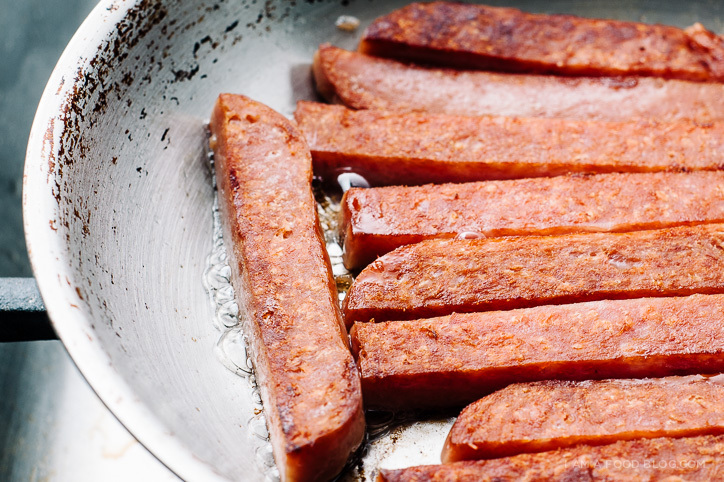 Heat up a skillet that will hold all the spam strips over medium-low heat. Cook the spam until crisp and brown, flipping so all sides are even. While the spam is cooking (it can take a while -it’s best to cook spam low and slow) make your tamago-yaki (recipe below). When the spam is crisp, remove from the heat and drain on paper towels. Take a rice paper wrapper and completely submerge it in a bowl of hot tap water for 10-15 seconds. Place the wrapper on a plate or cutting board – it’ll continue to soften as your assembling your roll. Add fillings as desired: spinach, spam, tamago-yaki, vermicelli. Fold the bottom half of the wrapper up over the filling, hold the fold in place, fold in the sides and roll. Enjoy with fish sauce, if desired. Repeat as needed. The egg will start to cook and solidify immediately. The eggs don’t need to be entirely cooked, in fact, they should be a tiny bit moist on top so that the egg sticks to itself. Using a spatula, fold the egg over onto itself. You want to fold it at 1 – 1 1/2 inch intervals so at the end you have flat omelette that’s about 1 -1 1/2 inches wide. Remove from the pan and set aside on a cutting board. Repeat with the remaining eggs. Cut the tamago-yaki into strips 3 inch x 1/2 inch strips and use in the salad rolls. YES. YES. YES. So many fist-bump emojis for your love of Spam & eggs, Steph!! (Also, I had no idea I was doing something as classy as “confit”-ing my Spam when I’ve been frying it all these years.) I just made my very first venture into rice paper rolls this weekend (giggling the whole time at my funny-shaped rolls) and I’m thinking this is going to have to be my next one. You are the g-r-e-a-t-e-s-t. These look so yummy – they just scream childhood to me! I’ve never been a spam fan (I can be a bit of snob about canned food), so I clicked on the bloglovin’ link feeling a bit meh… and then the minute your photos loaded, I wanted one. More than one. I wanted to pick them right off the screen and eat them all. 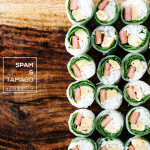 Of course iamfoodblog can make spam look mouthwatering. And rolled in rice paper? 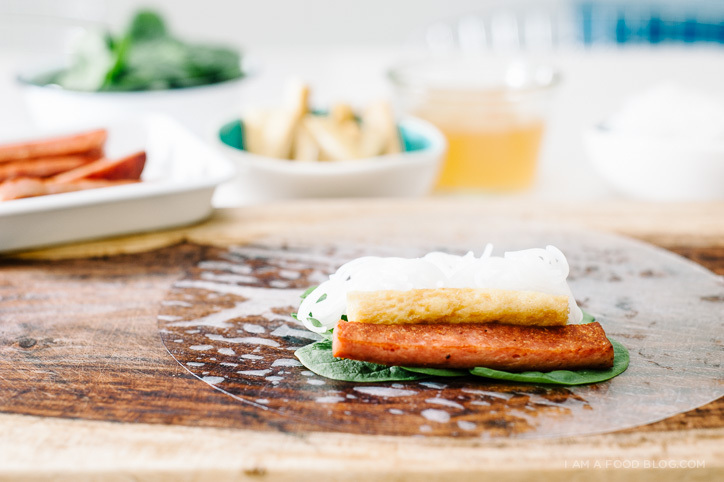 I can just imagine how perfect the crispy crunchy spam and the soft rice paper tastes… yum! Oh yeah – count me in on the spam-love. Grew up on it in Hong Kong and we all love it to this day (my 9-year old loves it a little too much). I just made spring rolls for the first time a couple of weeks ago and I love the idea of putting leftovers or anything in it besides just the usual veggies and shrimp. This is something I’d devour. Oh my gawd!!! I need SPAM. Like, right now. Truth? I’ve never tried spam. It has always terrified me, BUT you make it look delicious!!! This brings me back to the chan tang with its coffee tea milk and french toast with golden syrup. I used to get this but on bread with a drink of the ice tea as a real treat. After seeing this, I think I need to stop by the local for a can of spam. 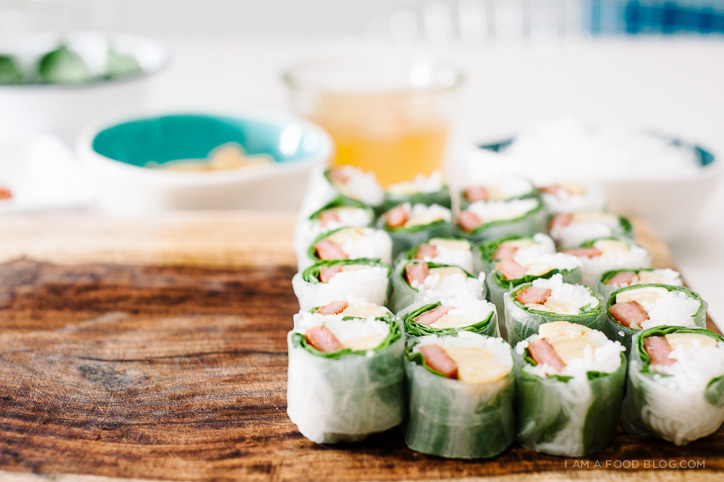 I love spring rolls and I love this idea! I also love I didn’t know what to make for dinner and now have an option! It’s like a fancier (healthier? Maybe?) version of SPAM musubi! I won’t even admit how much of that I ate on our last trip to Hawaii. Plus, my husband is hawaiian and will make it for me whenever I ask. WIN. Spam and eggs and rice. That’s my jam. 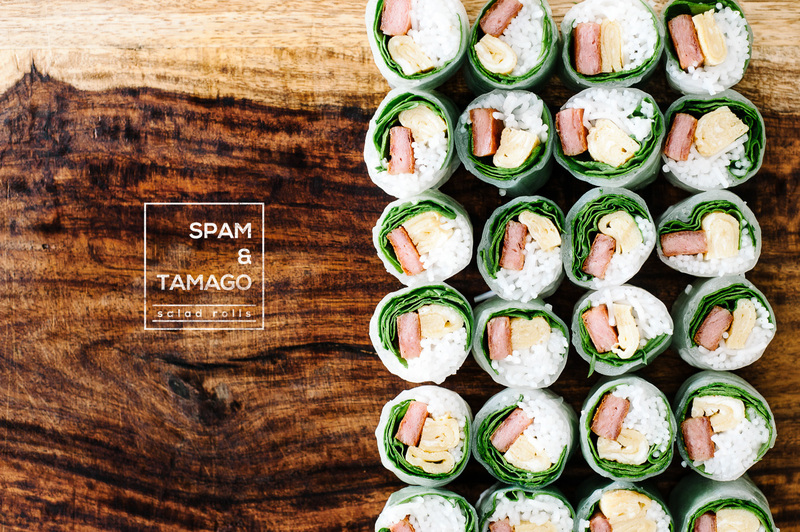 A spam and egg salad roll is my new jam. LOVE LOVE LOVE this!! YES I was also a huge fan of spam + eggs + rice as a kid!!! Loll ditto Cynthia–I love the idea that my fam has been confit-ing spam all these years when we fry it! We always used to lay it out on paper towels after frying and there was always SO MUCH GREASE. So tasty. Almost makes me want to revert from vegetarianism…I LOVE THIS. OMG. Spam is one of my favorite things to work with! These look faboulous. I am going to have to cook these up as soon as possible. Any tips on how to keep the rice wrapper from sticking to everything… and by everything I mean my fingers? I’m glad someone is on board with spam like I am, especially with egg salad?!?! Oh yes. I remember when a Top Chef challenge was to make something with spam and I basically wanted to eat all the things. what kind of pan are you using for this non-stick technique? it’s just a regular non-stick i got from target. hope that helps!